Bangalore (Indian English: [ˈbæŋgəloːɾ]), officially Bengaluru (Kannada: ಬೆಂಗಳೂರು, ['beŋgəɭuːru]), serves as the capital of the Indian state of Karnataka. Located on the Deccan Plateau in the south-eastern part of Karnataka, Bangalore has an estimated metropolitan population of 65 lakh (6.5 million), making it India's third-most populous city and fifth-largest metropolitan area. Though historically attested at least since 900 C.E., recorded history of the city starts from 1537, when Kempe Gowda I, widely regarded as the founder of modern Bangalore, built a mud fort and established it as a province of the Vijayanagara Empire. During the British Raj, Bangalore developed as a center for colonial rule in South India. The establishment of the Bangalore Cantonment brought in large numbers of migrants from other parts of the country. Since independence in 1947, Bangalore has developed into one of India's major economic hubs and today counts among the best places in the world to do business.. Several public sector heavy industries, software companies, aerospace, telecommunications, machine tools, heavy equipment, and defense establishments call Bangalore home. Known for a long time as the 'Pensioner's paradise', Bangalore today has received the appellation of the Silicon valley of India due to its pre-eminent position as India's technology capital. Home to prestigious colleges and research institutions, the city has the second-highest literacy rate among the metropolitan cities in the nation. As a large and growing metropolis in the developing world, Bangalore continues to struggle with problems such as air pollution, traffic congestion, and crime. An inscription, dating back to 890 C.E., shows Bengaluru is over 1000 years old. But it stands neglected at the Parvathi Nageshwara Temple in Begur near the city… written in Hale Kannada (Old Kannada) of the ninth century C.E., the epigraph refers to a Bengaluru war in 890 in which Buttanachetty, a servant of Nagatta, died. Though this has been recorded by historian R. Narasimhachar in his Epigraphia of Carnatica (Vol. 10 supplementary) (1898), no efforts have been made to preserve it. A popular anecdote (although one contradicted by historical evidence) recounts that the eleventh-century Hoysala king Veera Ballala II, while on a hunting expedition, lost his way in the forest. Tired and hungry, he came across a poor old woman who served him boiled beans. The grateful king named the place "benda kaal-ooru" (Kannada: ಬೆಂದಕಾಳೂರು) (literally, "town of boiled beans"), eventually colloquialized to "Bengalūru". Also theories abound that the name has a floral origin, derived from the tree Benga or "Ven-kai," also known as the Indian Kino Tree (Pterocarpus marsupium). On December 11, 2005, the Government of Karnataka announced that it had accepted a proposal by Jnanpith Award winner U. R. Ananthamurthy to rename Bangalore to Bengaluru, its name in Kannada. On September 27, 2006, the Bangalore Mahanagara Palike (BMP) passed a resolution to implement the proposed name change, which the Government of Karnataka accepted, deciding to officially implement the name change from November 1, 2006. That process has been currently stalled due to delays in getting clearances from the Union Home Ministry. The Bugle Rock - one of Kempe Gowda II's four watch towers also served as the site of a military camp for the Mysore army during the third Anglo-Mysore war. 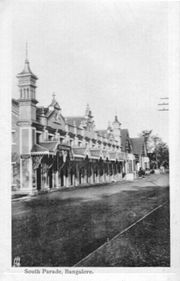 South Parade (now Mahatma Gandhi Road) during colonial times. After centuries of the rule of the Western Gangas, the Cholas captured Bangalore in 1024 which later passed on to the Chalukya-cholas in 1070. In 1116 the Hoysala Empire, overthrew the Cholas and extended its rule over Bangalore. A vassal of the Vijayanagara Empire, Kempe Gowda I, who built a mud fort and a Nandi Temple in the proximity of modern Bangalore in 1537, founded modern Bangalore. Kempe Gowda referred to the new town as his "gandu bhoomi" or "Land of Heroes". Within the fort, the town divided into smaller divisions called petes (IPA: [peɪteɪ]). The town had two main streets: Chickkapete Street, which ran east-west, and Doddapete Street, which ran north-south. Their intersection formed the Doddapete Square — the heart of Bangalore. Kempe Gowda's successor, Kempe Gowda II, built four famous towers that marked Bangalore's boundary. 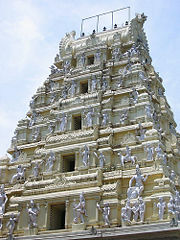 During the Vijayanagara rule, Bangalore went by the name "Devarāyanagara" and "Kalyānapura" ("Auspicious City"). After the fall of the Vijayanagara Empire, Bangalore's rule changed hands several times. In 1638, a large Bijapur army led by Ranadulla Khan and accompanied by Shahji Bhonsle defeated Kempe Gowda III and Shahji received Bangalore as a jagir. In 1687, the Mughal general Kasim Khan defeated Ekoji, son of Shahji, and then sold Bangalore to Chikkadevaraja Wodeyar (1673–1704) of Mysore for 300,000 rupees. After the death of Krishnaraja Wodeyar II in 1759, Hyder Ali, Commander-in-Chief of the Mysore Army, proclaimed himself the de facto ruler of Mysore. The kingdom later passed to Hyder Ali's son Tippu Sultan, known as the Tiger of Mysore. Bangalore eventually incorporated into the British East Indian Empire after Tippu Sultan died in defeat in the Fourth Anglo-Mysore War (1799). The British returned administrative control of the Bangalore "pete" to the Maharaja of Mysore, choosing only to retain the Cantonment under their jurisdiction. The 'Residency' of Mysore State, first established at Mysore in 1799, later shifted to Bangalore in the year 1804. Abolished in 1843 only to be revived in 1881 at Bangalore, the Mysore State closed down in 1947 with the departure of the British. The British found it easier to recruit employees in the Madras Presidency and relocate them to cantonment area during this period. The Kingdom of Mysore relocated its capital from Mysore city to Bangalore in 1831. Two important developments during that period contributed to the rapid growth of the city: the introduction of telegraph connections and a rail connection to Madras in 1864. In the nineteenth century, Bangalore essentially became a twin city, with the "pete," with residents predominantly Kannadigas, and the "cantonment" created by the British, with residents predominantly Tamils. A Bubonic plague epidemic in 1898 hit Bangalore, dramatically reducing its population. New extensions in Malleshwara and Basavanagudi developed in the north and south of the pete. The government laid telephone lines to help co-ordinate anti-plague operations, appointing a health officer to the city in 1898. In 1906, Bangalore became the first city in India to have electricity, powered by the hydroelectric plant situated in Shivanasamudra. Bangalore's reputation as the Garden City of India began in 1927 with the Silver Jubilee celebrations of the rule of Krishnaraja Wodeyar IV. Several projects such as the construction of parks, public buildings and hospitals had been instituted to beautify the city. After Indian independence in August 1947, Bangalore remained in the new Mysore State of which the Maharaja of Mysore served as the Rajapramukh. Public sector employment and education provided opportunities for Kannadigas from the rest of the state to migrate to the city. Bangalore experienced rapid growth in the decades 1941–51 and 1971–81 , witnessing the arrival of many immigrants from northern Karnataka. By 1961, Bangalore had become the sixth largest city in India, with a population of 1,207,000. In the decades that followed, Bangalore's manufacturing base continued to expand with the establishment of private companies such as Motor Industries Company (MICO; a subsidiary of Robert Bosch GmbH), which set up its manufacturing plant in the city. 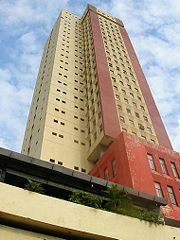 Bangalore experienced a boom in its real estate market in the 1980s and 1990s, spurred by capital investors from other parts of the country who converted Bangalore's large plots and colonial bungalows to multi-storied apartments. In 1985, Texas Instruments became the first multinational to set up base in Bangalore. Other Information Technology companies followed suit and by the end of the twentieth century, Bangalore had firmly established itself as the Silicon Valley of India. Bangalore lies in the southeast of the South Indian state of Karnataka, in the heart of the Mysore Plateau (a region of the larger Precambrian Deccan Plateau) at an average elevation of 920 m (3,018 feet). The city sits at 12.97° N 77.56° E and covers an area of 741 km² (286 mi²). The majority of the city of Bangalore lies in the Bangalore Urban district of Karnataka and the surrounding rural areas form a part of the Bangalore Rural district. The Government of Karnataka has carved out the new district of Ramanagaram from the old Bangalore Rural district. Bangalore has a flat topology except for a central ridge running NNE-SSW. Doddabettahalli sits at the highest point, 962 m (3,156 ft) and lies on that ridge. No major rivers run through the city, though the Arkavathi and South Pennar cross paths at the Nandi Hills, 60 km (37 mi.) to the north. River Vrishabhavathi, a minor tributary of the Arkavathi, arises within the city at Basavanagudi and flows through the city. The rivers Arkavathi and Vrishabhavathi together carry much of Bangalore's sewage. A sewerage system, constructed in 1922, covers 215 km² (133 mi²) of the city and connects with five sewage treatment centers located in the periphery of Bangalore. In the sixteenth century, Kempe Gowda I constructed many lakes to meet the town's water requirements. The Kempambudhi Kere, since overrun by modern development, had been prominent among those lakes. In the earlier half of twentieth century, Sir Mirza Ismail (Diwan of Mysore, 1926–41 C.E.) commissioned the Nandi Hills waterworks to provide a water supply to the city. Currently, the river Kaveri provides around 80 percent of the total water supply to the city with the remaining 20 percent being obtained from the Thippagondanahalli and Hesaraghatta reservoirs of the river Arkavathy. Bangalore receives 800 million liters (211 million US gallons) of water a day, more than any other Indian city. Even with that abundance of water, Bangalore sometimes faces shortages, especially during the summer season in the years of low rainfall. A random sampling study of the Air Quality Index (AQI) of 20 stations within the city indicated scores that ranged from 76 to 314, suggesting heavy to severe air pollution around areas of traffic concentration. Bangalore has a handful of freshwater lakes and water tanks, the largest Madivala tank, Hebbal lake, Ulsoor lake and Sankey Tank. Groundwater occurs in silty to sandy layers of the alluvial sediments. The Peninsular Gneissic Complex (PGC) makes up the most dominant rock unit in the area and includes granites, gneisses and migmatites, while the soils of Bangalore consist of red laterite and red, fine loamy to clayey soils. Large deciduous canopy and minority coconut trees make up most of the city's vegetation. Though Bangalore has been classified as a part of the seismic zone II (a stable zone), it has experienced quakes of magnitude as high as 4.5. Due to its high elevation, Bangalore usually enjoys salubrious climate throughout the year, although unexpected heat waves catch residents by surprise during the summer. Bangaloreans commonly refrain that summer has gotten progressively hotter over the years. That could be due to the loss of green cover in the city, increased urbanization and the resulting urban heat island effect, as well as possibly climate change. January, the coolest month, has an average low temperature of 15.1 °C and the hottest month, April, has an average high temperature of 33.6 °C. Winter temperatures rarely drop below 12 °C (54 °F), and summer temperatures seldom exceed 36–37 °C (100 °F). Bangalore receives rainfall from both the northeast and the southwest monsoons and September, October and August measure the wettest months, in that order. Fairly frequent thunderstorms, which occasionally cause power outages and local flooding, moderated the summer heat. The heaviest rainfall recorded in a 24-hour period is 180 mm (7 in) recorded on October 1, 1997. The Karnataka High Court, located in Bangalore, serves as the supreme judicial body in Karnataka. The Bruhat Bengaluru Mahanagara Palike (BBMP, Greater Bangalore Municipal Corporation) directs the civic administration of the city. 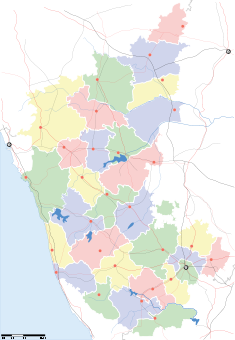 Greater Bangalore formed in 2007 by merging 100 wards of the erstwhile Bangalore Mahanagara Palike, with the neighboring seven City Municipal Councils (CMC), one Town Municipal Council and 110 villages around Bangalore. A city council, comprised of elected representatives called "corporators," one from each of the wards (localities) of the city, runs Bruhat Bengaluru Mahanagara Palike. Popular elections once every five years elect the council members. The people elect a mayor and commissioner of the council through a quota system from a Scheduled Castes and Tribes candidate or an Other Backward Class female candidate. Members contesting elections to the council represent one of more of the state's political parties. Elections to the newly-created body have been placed on hold due to delays in delimitation of wards and finalizing voter lists. 150 wards, up from the 100 wards of the old Bangalore Mahanagara Palike, participate. Bangalore's rapid growth has created traffic congestion and infrastructural obsolescence problems that the Bangalore Mahanagara Palike have found challenging to address. A 2003 Battelle Environmental Evaluation System (BEES) evaluation of Bangalore's physical, biological and socioeconomic parameters indicated that Bangalore's water quality and terrestrial and aquatic ecosystems measure close to ideal, while the city's socioeconomic parameters (traffic, quality of life) scored poorly. The BMP has been criticized by the Karnataka High Court, citizens and corporations for failing to effectively address the crumbling road and traffic infrastructure of Bangalore. The unplanned nature of growth in the city resulted in massive traffic gridlocks that the municipality attempted to ease by constructing a flyover system and by imposing one-way traffic systems. The Public Utility Building on MG Road. Some of the flyovers and one-ways mitigated the traffic situation moderately but proved unable to adequately address the disproportionate growth of city traffic. In 2005 both the Central Government and the State Government allocated considerable portions of their annual budgets to address Bangalore's infrastructure. The Bangalore Mahanagara Palike works with the Bangalore Development Authority (BDA) and the Bangalore Agenda Task Force (BATF) to design and implement civic projects. Bangalore generates about 3,000 tons of solid waste per day, with about 1,139 tons collected and sent to composting units such as the Karnataka Composting Development Corporation. The municipality dumps the remaining collected solid waste in open spaces or on roadsides outside the city. A Police Commissioner, an officer with the Indian Police Service (IPS), heads the Bangalore City Police (BCP). The BCP has six geographic zones, including the Traffic Police, the City Armed Reserve, the Central Crime Branch and the City Crime Record Bureau and runs 86 police stations, including two all-women police stations. As capital of the state of Karnataka, Bangalore houses important state government facilities such as the Karnataka High Court, the Vidhana Soudha (the home of the Karnataka state legislature) and Raj Bhavan (the residence of the Governor of Karnataka). Bangalore contributes two members to India's lower house of parliament, the Lok Sabha, and 24 members to the Karnataka State Assembly. In 2007, the Delimitation Commission of India reorganized the constituencies based on the 2001 census, and thus the number of Assembly and Parliamentary constituencies in Bangalore has been increased to 28 and three respectively. Those changes will take effect from the next elections. The Karnataka Power Transmission Corporation Limited (KPTCL) regulates electricity in Bangalore. Like many cities in India, Bangalore experiences scheduled power cuts, especially over the summer, to allow electricity providers to meet the consumption demands of households as well as corporations. Bangalore's Rs. 260,260 crore (USD 60.5 billion) economy (2002–03 Net District Income) makes it a major economic center in India. Indeed, Bangalore ranks as India's fourth largest and fastest growing market. Bangalore's per capita income of Rs. .49,000 (US$ 1,160) ranks the highest for any Indian city. The city stands as the third-largest hub for high net worth individuals (HNWI / HNIs), after Mumbai and Delhi. Over 10,000 individual dollar millionaires and around 60,000 super-rich people who have an investable surplus of Rs. 4.5 crore and Rs. 50 lakh respectively live in Bangalore. As of 2001, Bangalore's share of Rs. 1660 crore (US$ 3.7 billion) in Foreign Direct Investment ranked the third highest for an Indian city. In the 1940s industrial visionaries such as Sir Mirza Ismail and Sir Mokshagundam Visvesvaraya played an important role in the development of Bangalore's strong manufacturing and industrial base. Bangalore serves as headquarters to several public manufacturing heavy industries such as Hindustan Aeronautics Limited (HAL), National Aerospace Laboratories (NAL), Bharat Heavy Electricals Limited (BHEL), Bharat Electronics Limited, Bharat Earth Movers Limited (BEML) and Hindustan Machine Tools (HMT). In June 1972 the Indian government established the Indian Space Research Organisation (ISRO) under the Department of Space and headquartered in the city. Bangalore has earned the title "Silicon Valley of India" because of the large number of Information Technology companies located in the city which contributed 33 percent of India's Rs. 144,214 crore (US$ 32 billion) IT exports in 2006-07. Bangalore's IT industry divides into three main "clusters" — Software Technology Parks of India, Bangalore (STPI); International Technology Park Bangalore (ITPB), formerly International Technology Park Ltd. (ITPL); and Electronics City. Infosys and Wipro, India's second and third largest software companies, have their largest campus in Electronics City. As headquarters to many of the global SEI-CMM Level 5 Companies, Bangalore holds a prominent place on the global IT map. The growth of Information Technology has presented the city with unique challenges. Ideological clashes sometimes occur between the city's IT moguls, who demand an improvement in the city's infrastructure and the state government, whose electoral base rests primarily the people in rural Karnataka. Bangalore serves as a hub for biotechnology related industry in India and in the year 2005, around 47% of the 265 biotechnology companies in India had headquarters located there; including Biocon, India's largest biotechnology company. Bangalore's HAL Airport (IATA code: BLR) ranks as India's fourth busiest and functions as both domestic and international airport, connecting well to several destinations in the world. Unlike most airports in the country, controlled by the Airports Authority of India, the Hindustan Aeronautics Limited owns and operates this airport, and also uses it to test and develop fighter aircraft for the Indian Air Force. With the liberalization of India's economic policies, many domestic carriers such as SpiceJet, Kingfisher Airlines, Jet Airways and Go Air have started servicing the city, leading to congestion problems at this airport. Aviation experts expect the situation to ease when the new Bangalore International Airport, presently under construction in Devanahalli in the outskirts of Bangalore, becomes operational. Currently targeted for inauguration in April 2008, this airport will have two runways with a capacity to handle 11 million passengers per year. Air Deccan and Kingfisher Airlines have their headquarters in Bangalore. The Indian Railways connects Bangalore well to the rest of the country. The Rajdhani Express connects Bangalore to New Delhi, the capital of India, Mumbai, Chennai, Kolkata, and Hyderabad, as well as other major cities in Karnataka. An intra-city rapid rail transport system called the Namma Metro has been in development, expecting to be operational in 2011. Once completed, that will encompass a 33 km (20.5 mi) elevated and underground rail network, with 32 stations in Phase I and more being added in Phase II. Three-wheeled, black and yellow auto-rickshaws, referred to as autos, represent a popular form of transport. Metered, they accommodate up to three passengers. Several operators commonly referred to Citi taxis provide taxi service within Bangalore, taking up to four passengers. Usually metered, the Citi taxis charge higher fares than auto-rickshaws. Buses operated by Bangalore Metropolitan Transport Corporation (BMTC) represent the only means of public transport available in the city. While commuters can buy tickets on boarding those buses, BMTC also provides an option of a bus pass to frequent users. BMTC runs air-conditioned red-colored Volvo buses on major routes. With an estimated population of 5,281,927 in the year 2007, Bangalore ranks the third most populous city in India and the 27th most populous city in the world. With a decadal growth rate of 38 percent, Bangalore represented the fastest-growing Indian metropolis after New Delhi for the decade 1991–2001. Residents of Bangalore refer to themselves as Bangaloreans in English or Bengaloorinavaru in Kannada. While Kannadigas make up the majority of the population, the cosmopolitan nature of the city has caused people from other states of India to migrate to Bangalore and settle there. Scheduled Castes and Tribes account for 14.3 percent of the city's population. People widely speak Kannada, the official language of the state of Karnataka, in Bangalore. According to the 2001 census of India, 79.37 percent of Bangalore's population professes Hinduism, roughly the same as the national average. Muslims comprise 13.37 percent of the population, again roughly the same as the national average, while Christians and Jains account for 5.79 percent and 1.05 percent of the population, respectively, double that of their national averages. Women make up 47.5 percent of Bangalore's population. Bangalore has the second highest literacy rate (83 percent) for an Indian metropolis, after Mumbai. Roughly 10 percent of Bangalore's population lives in slums — a relatively low proportion when compared to other cities in the developing world such as Mumbai (42 percent) and Nairobi (60 percent). The 2004 National Crime Records Bureau statistics indicate that Bangalore accounts for 9.2 percent of the total crimes reported from 35 major cities in India. Delhi and Mumbai accounted for 15.7 percent and 9.5 percent respectively. Bangalore has been nicknamed the "Garden City of India"  because of its greenery and the presence of many public parks, including the Lal Bagh and Cubbon Park. Dasara, a traditional celebratory hallmark of the old Kingdom of Mysore, constitutes a state festival celebrated with great vigor. Deepavali, the "Festival of Lights," transcends demographic and religious lines and represents another important festival. Other traditional Indian festivals such as Ganesh Chaturthi, Ugadi, Sankranthi, Eid ul-Fitr, and Christmas enjoy wide participation. Kannada film industry locates their main studios in Bangalore, producing many Kannada movies each year. The diversity of cuisine available reflects of the social and economic diversity of Bangalore. Roadside vendors, tea stalls, and South Indian, North Indian, Chinese and Western fast food enjoy wide popularity in the city. Udupi restaurants prove immensely popular and serve predominantly vegetarian, regional cuisine. Bangalore has become a major center of Indian classical music and dance. Classical music and dance recitals enjoy heavy attendance throughout the year, particularly during the Ramanavami and Ganesha Chaturthi festivals. The Bengaluru Gayana Samaja has been at the forefront of promoting classical music and dance in the city. The city also has a vibrant Kannada theater scene with organizations like Ranga Shankara and Benaka leading the way. Some of India's top names in theater like the late B. V. Karanth, Girish Karnad and others have called the city home. Bangalore hosts an active presence of Rock and other forms of western music. Bands like Iron Maiden, Aerosmith, Scorpions, Roger Waters, Uriah Heep, Jethro Tull, Joe Satriani, INXS, No Doubt, Safri Duo, Black Eyed Peas, Deep Purple, Mark Knopfler, The Rolling Stones, and Bryan Adams, among others, have performed in the city. Bangalore has earned the title "Pub Capital of India". Cricket represents one of the most popular sports in Bangalore. A significant number of national cricketers have come from Bangalore, including former Indian cricket team captain Rahul Dravid. Other cricketing greats from Bangalore include Gundappa Vishwanath, Anil Kumble, E.A.S. Prasanna, Venkatesh Prasad, Bhagwat Chandrasekhar, Syed Kirmani and Roger Binny. Many children play gully cricket on the roads and in the city's many public fields. Bangalore's main international cricket stadium, M. Chinnaswamy Stadium, hosted its first match in 1974. Bangalore has a number of elite clubs, like the Bangalore Golf Club, the Bowring Institute and the exclusive Bangalore Club, which counts among its previous members Winston Churchill and the Maharaja of Mysore. Until the early nineteenth century, most schools in Bangalore had been founded by religious leaders for pupils from their religions. The western system of education came into vogue during the rule of Mummadi Krishnaraja Wodeyar when two schools established in Bangalore. The Wesleyan Mission followed in 1851 and the Bangalore High School, started by the Government, began in 1858. In the present day, schools for young children in Bangalore take the form of kindergarten education. Schools affiliated with boards of education like the Karnataka state board, ICSE, CBSE, National Open School (NOS), IGCSE and IB offer primary and secondary education in Bangalore. Three kinds of schools operate in Bangalore viz. government (run by the government), aided (the government provides financial aid) and un-aided private (without financial aid). After completing their secondary education, students typically enroll in Junior College (also known as Pre-University) in one of three streams — Arts, Commerce or Science. Upon completing the required coursework, students enroll in general or professional degrees. Bangalore University, established in 1964, has its campus in Bangalore. Around 500 colleges, with a total student enrollment of 300,000, affiliate to the university. The university has two campuses within Bangalore; Jnanabharathi and Central College. Indian Institute of Science, Bangalore, established in 1909, stands as the premier institute for scientific research and study in India. National Law School of India University (NLSIU), one of the most sought after law colleges in India, and the Indian Institute of Management, Bangalore, one of the premier management schools in India, have campuses in Bangalore. The first printing-press set up in Bangalore in 1840. In 1859, Bangalore Herald became the first English bi-weekly newspaper published in Bangalore and in 1860, Mysore Vrittanta Bodhini became the first Kannada newspaper circulated in Bangalore. Currently, Vijaya Karnataka and The Times of India represent the most widely circulated Kannada and English newspapers in Bangalore respectively. Bangalore got its first radio station when All India Radio, the official broadcaster for the Indian Government, started broadcasting from its Bangalore station on November 2, 1955. The radio station transmitted in AM till in 2001. Radio City became the first private channel in India to transmit FM radio from Bangalore. In recent years, a number of FM channels have begun broadcasting from Bangalore. The city also has various clubs for HAM radio enthusiasts. Bangalore received its first television transmission November 1, 1981 when Doordarshan established a relay center. Doordarshan established a production center in its Bangalore office in 1983, introducing a news program in Kannada on November 19, 1983. Doordarshan also launched a Kannada satellite channel on August 15, 1991, now christened DD Chandana. The advent of private satellite channels in Bangalore started in September 1991 when Star TV inaugurated broadcast. Though the number of satellite TV channels available for viewing in Bangalore has grown over the years, the cable operators play a major role in the availability of those channels, leading to occasional conflicts. Direct To Home services may be purchased in Bangalore now. Internet services inaugurated in Bangalore in early 1990s with the first internet service provider STPI offering access. They only provided internet service to corporates. VSNL offered dial-up internet services to the general public at the end of 1995. Currently, Bangalore has the largest number of broadband internet connections in India. ↑ Ramachandra T. V.; Uttam Kumar (Jan 2010). Greater Bangalore: Emerging Urban Heat Island. GIS Development. Retrieved March 14, 2012. ↑ Cities having population 1 lakh and above. censusindia. The Registrar General & Census Commissioner, India. Retrieved March 14, 2012. ↑ Urban Agglomerations/Cities having population 1 lakh and above. Censusindia. The Registrar General & Census Commissioner, India. Retrieved March 14, 2012. ↑ "Bangalore mayor: I want your support, not sympathy", 1 May 2011. Retrieved March 14, 2012. 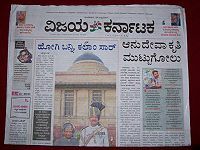 ↑ "Now, Shankarlinge Gowda appointed new commissioner of BBMP", 29 November 2011. Retrieved March 14, 2012. ↑ Christoph Dittrich,  "Bangalore: Globalisation and Fragmentation in India's Hightech-Capital." (PDF) Retrieved August 23, 2009. ↑ SAMAR HALARNKAR, Bangalore Crumbling. accessdate 2007-10-06 Indian Express/The Sunday Express. ↑ "History of Bangalore". Bangalore Guide 2006. ↑ Abraham Eraly. The Mughal Throne: The Saga of India's Great Emperors. (London: Phoenix, 2004. ISBN 0753817586), Incidental Data, 538. ↑ "Mysore (CAPITAL)". Encyclopedia Britannica, 1911 ed. ↑ Benjamin, Solomon. PDF. Environment&Urbanization 12 (1)(2006). United Nations Public Administration. 1 April 2000. ↑ Finance Budget for 2007–08 (PDF). Government of India. Retrieved 28 June 2007. ↑ "Budget to trigger growth of metros: PM." MSN India. 2006. Microsoft India. 12 February 2006. ↑ van Beukering, Sehker, et al. PDF. International Institute for Environment and Development. 2006. March 1999. ↑ Surendra Munshi. Poverty of Politics - If politicians lack vision, the rate of change will remain slow. Online Edition of The Telegraph. Retrieved 2007-10-25. ↑ Bangalore Helix to be a reality soon. Online edition of The Hindu, dated 2005-04-23. Retrieved 2007-10-04. ↑ Biocon in drug development talks with Bayer. Online webpage of Reuters, dated 2007-10-04. Retrieved 2007-10-04. ↑ "Kannadigas assured of all support". The Hindu. 2006. ↑ "Total Population, Slum Population…". Census of India, 2001. 2006. Government of India. ↑ PDF. National Crime Records Bureau. 2006. Government of India. 2004. ↑ M. Fazlul Hasan. Bangalore Through the Centuries. 1970. Encyclopedia Britannica, "Bangalore." Encyclopedia Britannica. 1911 ed. Eraly, Abraham. The Mughal Throne: The Saga of India's Great Emperors. London: Phoenix, 2004. ISBN 0753817586. PDF. Bangalore Metropolitan Rapid Transport Corporation Limited. 2006. Government of Karnataka. 2005. Hunter, Cotton, Burn, Meyer. "The Imperial Gazetteer of India". 2006. Oxford, Clarendon Press. 1909.
International Conference on High Performance Computing, and Yves Robert. High Performance Computing—HiPC 2006. 13th International Conference Bangalore, India, December 18-21, 2006 : Proceedings. Berlin: Springer, 2006. ISBN 9783540680390. Rao, Hayavadana. The Mysore State Gazetteer, 1929. This page was last modified on 11 May 2016, at 14:30.